Manila, Philippines - Official full trailer of "Diary ng Panget" (DNP) The Movie went viral after the video has been released on Youtube on Thursday, March 20, 2014. The romantic comedy film "Diary ng Panget" stars Pinoy Big Brother (PBB) winner James Reid and Nadine Lustre. The three-minute trailer introduces the love-hate relationship between a simple working student Eya Rodriguez (Lustre) and a rich heartthrob Cross Sandford (Reid). "Eya" is the protagonist and narrator of the movie, the titular 'panget'. Eya describes herself as an ugly person. She was hired by Mr Sandford to be the personal maid of his son, Cross. As of press time, the official trailer already garnered a total of half million views. "DNP" also became one of the trending topics on Twitter. 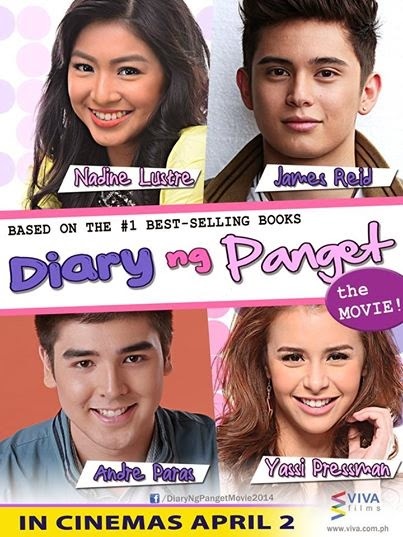 "Diary ng Panget" is a wattpad sensation that turns into a book (written by HaveYouSeenThisGirL) and soon to hit theaters this April 2, 2014 under Viva Entertainment. The original and unedited story was first posted on an online community called Wattpad and garnered over 12 million reads. The film adaptation was announced at the Manila International Book Fair 2013. The movie is directed by Andoy Ranay, which is also known for directing When the Love is Gone and written by Mel del Rosario, which is also known for writing Girl, Boy, Bakla, Tomboy and A Secret Affair.